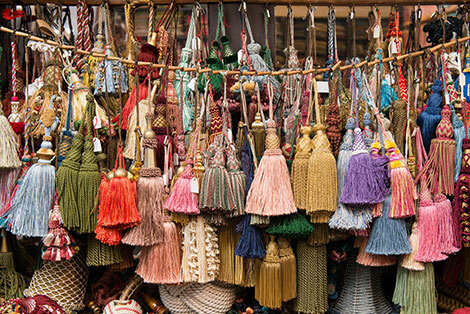 Decorative tassels are an asset to almost any (furnishing) style, as in their various designs they can once again underline the effect of the room. 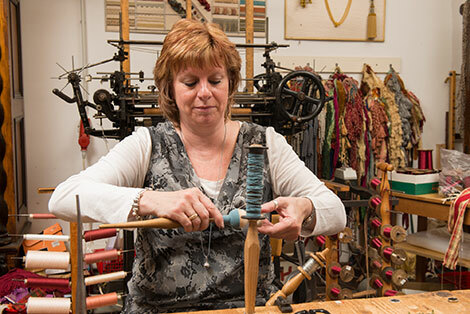 We manufacture the decorative elements lovingly by hand from fringes or hangings which are held together at the top by a head. 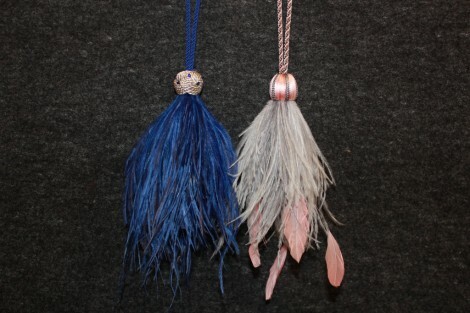 Tassels and small tassels can be used as key and handbag pendants, for tiebacks, as stair rope tassels, jewellery tassels, lamp rope tassels for hanging lamps, on napkin rings or as decorative tassel fringes e.g. on a border for upholstered furniture. 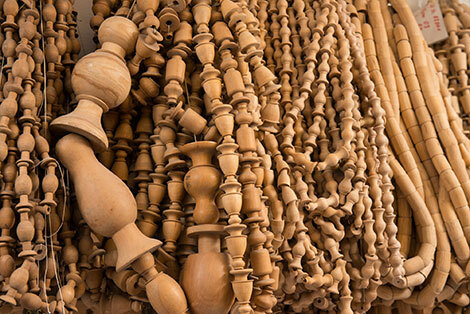 The imagination knows virtually no limits in design and use. 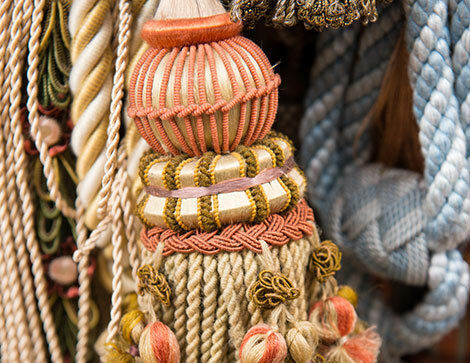 We can make your tassels from over 1,500 different yarns, making them individual and in exact accordance with your requests and needs. The inexhaustible range of possibilities ranges from simple and elegant to multi-coloured, cheerful and voluminous. 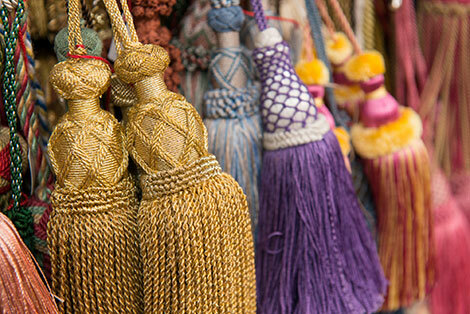 The tassels can thereby be produced with an elaborate or multi-level braided, reworked wood form, with decorative bead or ball. 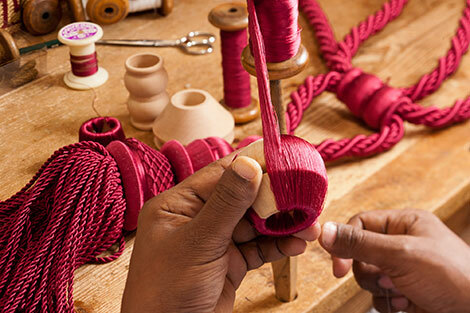 You can also select a specific knot as a head of the tassel, which holds together the loose silk threads, woven fringes or fine cords. 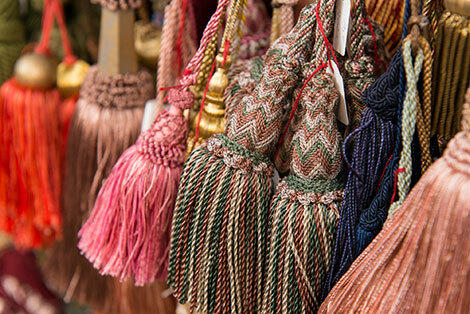 We are happy to help with the selection and can of course also provide various sample tassels to look at that match your pattern fabric.